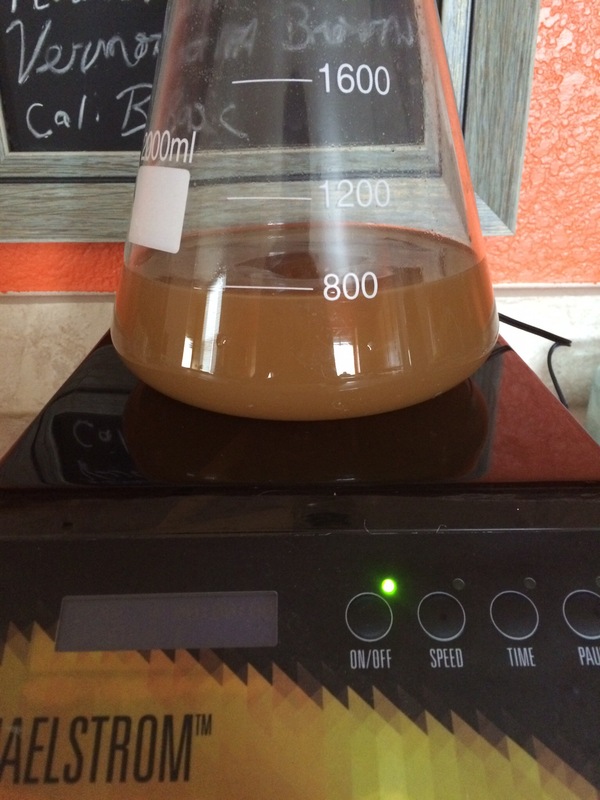 Compare the differences between a lambic style yeast blend to a 100% brett fermentation. Brew a split batch of Belgian golden ale, half fermented with ECY01 and half fermented with INIS913 & WLP645 under the same fermentation conditions. 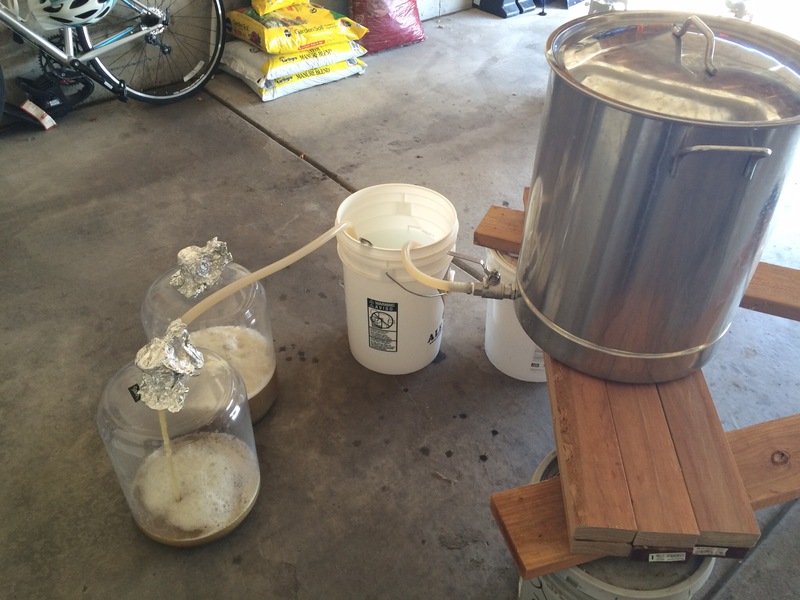 There wasn’t as much definitive information on homebrewing with brett over the Internet as I thought there would be. When researching how to make a starter I settled on the method noted by milk the funk. Internet lore seemed settled on making ~a week long starter using brett. My desire was to get a lot of the brett c flavors described on the White Labs website, talking to LHBS folks it was noted that INIS913 will ferment very fast, I assumed this would dominate the brett c if pitched together so I decided to pitch the brett c four days before the INIS913 to hopefully allow the slow moving brett c a chance to impart some pineapple flavors. By the end of the week the starter smelled very bretty and the spent wort tasted yummy. For the bug farm I simply removed the 500 billion cells from the fridge and waited to pitch. The ECY cell counts make me double take every time. Interestingly enough, INIS notes on their website they have the highest pitch counts in the industry, not quite sure they top ECY 🙂 . The night before brewing I purchased my grains and water, the following morning I heated my strike water mashing in at my target temp. The mash rested for an hour before I lautered the wort. The wort was boiled for 75 min adding hops at the prescribed times. 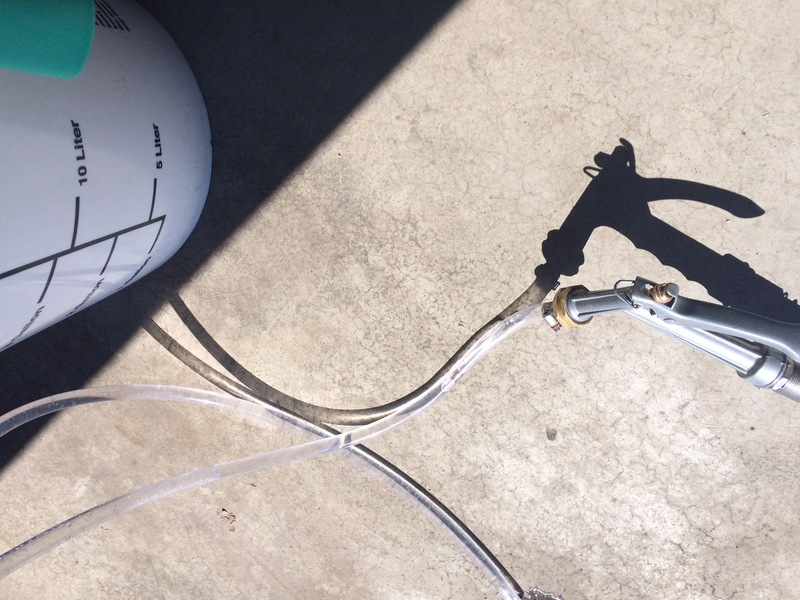 After the boil the wort was chilled using my hose faucet as a switch to turn the flow on and off as desired, it’s so effective and cuts trips to turn on and off the hose. After chilling, the wort was equally split between two PET plastic carboys and placed in my ferm chamber set to 75 degrees. One of the biggest benefits to brewing sours I’ve found, is the ability to pitch yeast nearly ASAP without any further cooling in the fridge. 24 hours post pitch, the ECY01 was roaring. Not really any activity going on in the brett beer. I’ve read online that there can be quite significant lag times when using brett. 4 days post pitch. 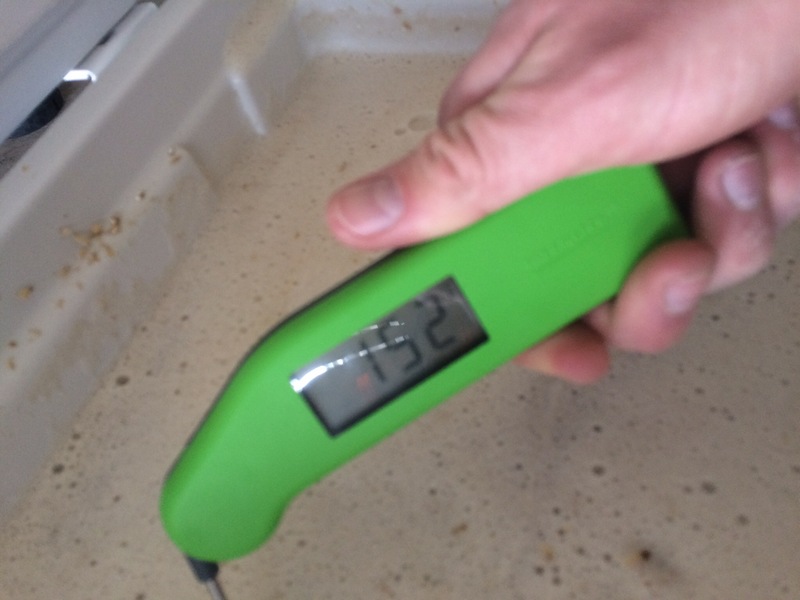 WLP645 had droped the beer from 1.071 to 1.064 and the INIS913 was pitched, within an hour there was two inches of krausen WOW! 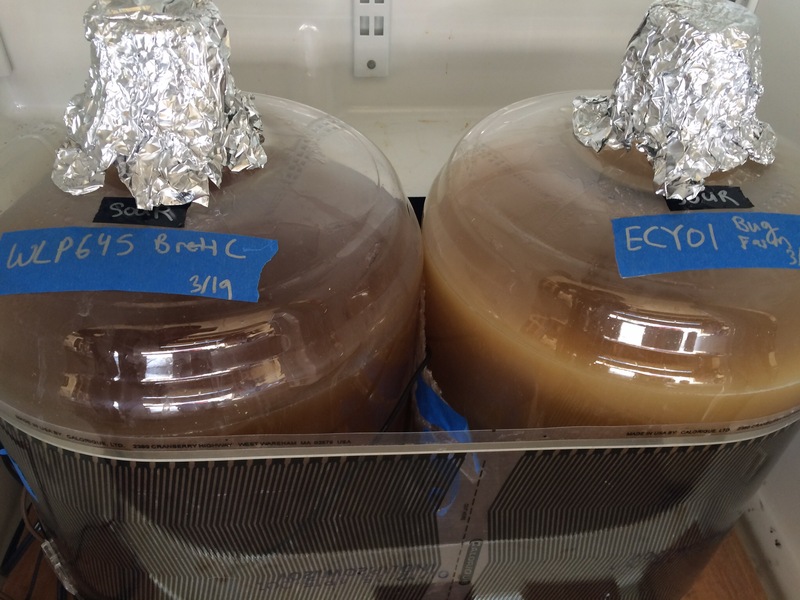 The ECY had been churning like a blender for a couple days and was now settling out, I’m assuming the saison yeast had consumed most of the sugars it could, your move brett/bacteria. The following morning the brett beer had shot up into the airlock, they were not kidding about INIS913 being an uber fast fermenter. 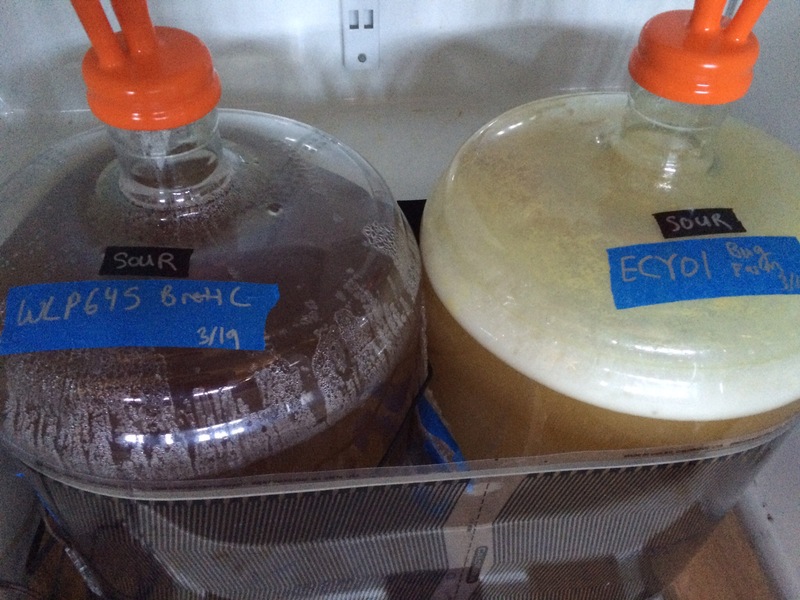 Two weeks post pitching the brett beer was finished fermenting and the ECY01 was finished primary. 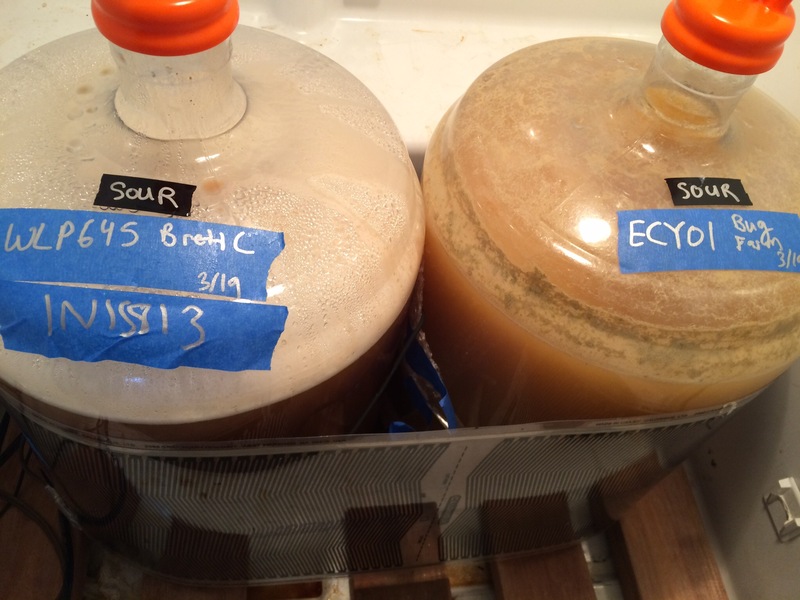 The brett beer was kegged and set to serve while the ECY01 was transferred to a 5 gallon glass carboy to age for roughly a year. 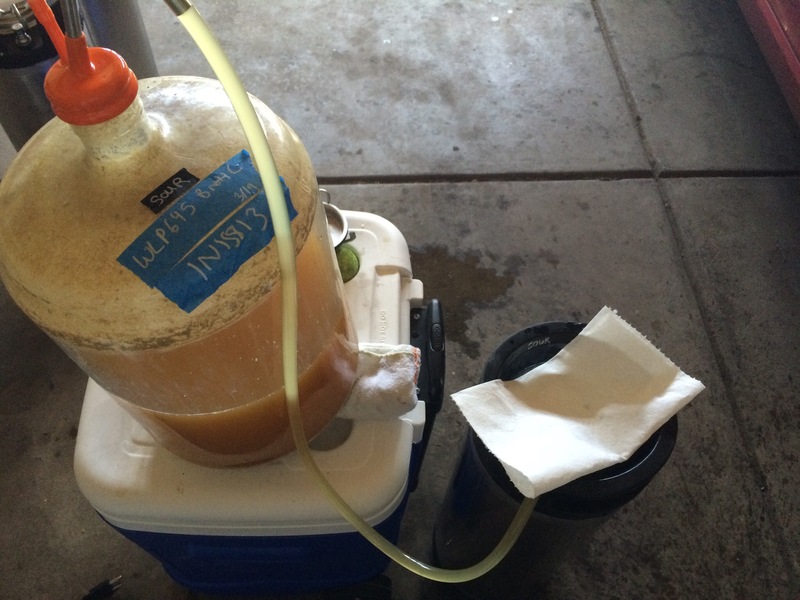 Kegging up the 100% brett beer. 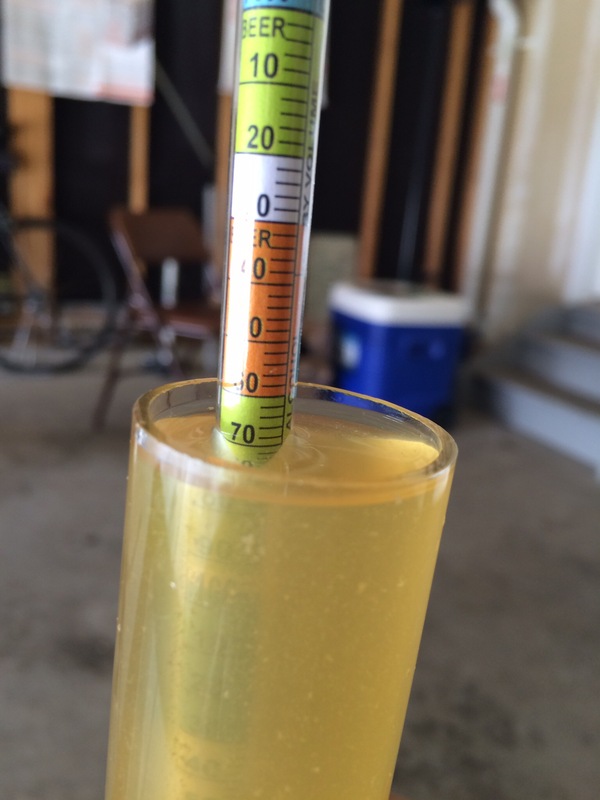 Final gravity was 1.006 after 14 days. 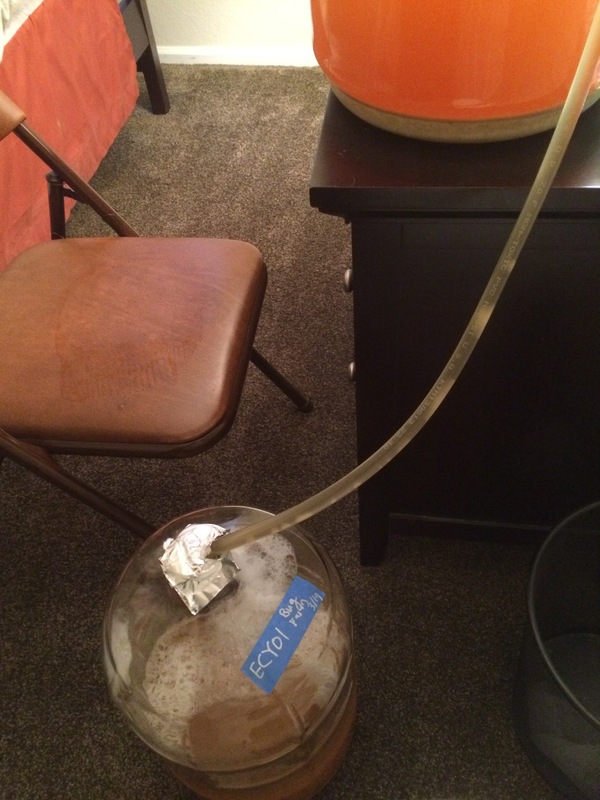 Racking the ECY01 into a glass carboy for long term aging. I’ve had the brett beer on tap now for a couple weeks and have to say I love this beer. The interplay of dryness, funk, and fruity flavors are unreal and certainly unlike anything I’ve brewed before. Appearance: New England IPA anyone? I waited two weeks to see if this beer would clear up some and not a chance. 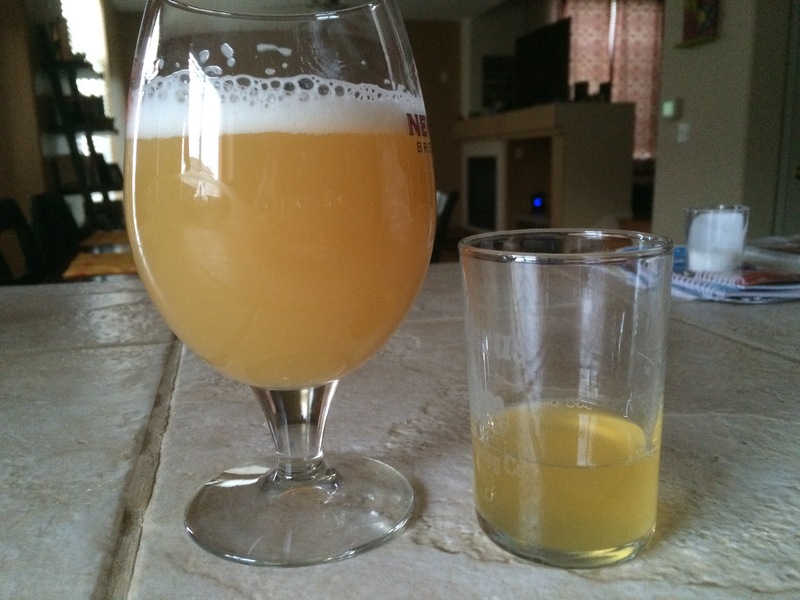 The brett in suspension gives the beer almost an orange/grapefruit juice like visual. I’ve actually really grown to appreciate the appearance of this beer. A small head forms but quickly dissipates. Aroma: Insane amounts of funk mixed with fruit juice. Hints of banana and pineapple dominate the nose. Taste: Bursting with fruit flavors, the banana from the nose dominates the flavor. As the beer warms a very pleasant funk comes through with tropical fruit notes like pineapple and mango. Mouthfeel: Not much here to be honest. The beer is bone dry given it’s 1.006 finishing gravity. As the sip goes down it dries your tongue and demands another sip. So refreshing. Overall: I’m ecstatic with this beer! For my first foray into 100% brett fermentation I could not be happier. The mixture of fruity goodness and funk actually blow my mind when i pour this beer. Since I don’t really have much of a baseline for 100% brett c it’s difficult for me to know if the flavors are mainly coming from the brett c or the INIS913 yeast. Given the gravity reading at the time of pitching INIS913, I’m going to guess its a mixture of both dominated by the INIS913. This strain is truly amazing; from the time of pitching, it was down to 1.006 in less than 7 days. It appears to work just as fast as many commercial sacc yeasts I have experience with. I highly recommend trying out this yeast if you can get your hands on it. 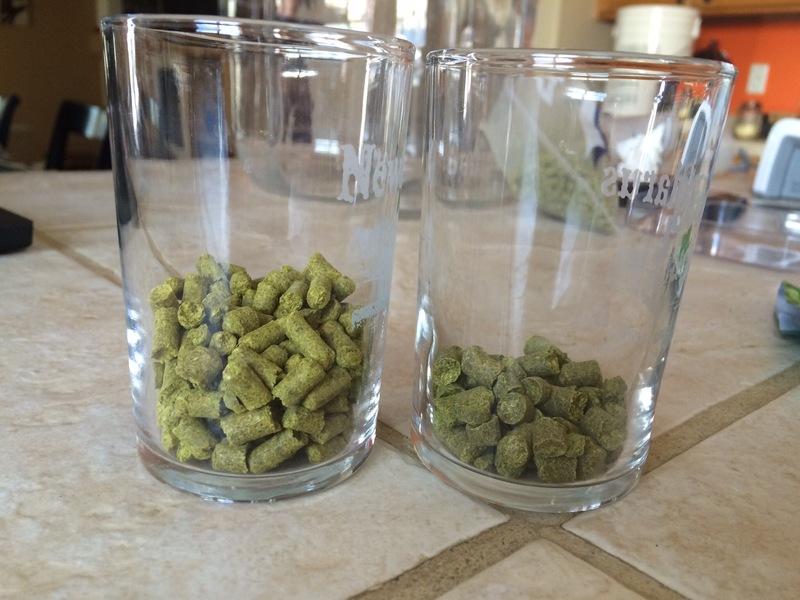 Or, culturing up the dregs of a Hop Savant and using that. I will be doing quite a bit more experimentation with this yeast in the coming year. For the ECY01, I tasted the small sample in the picture above at the time of racking to a glass carboy for long term storage and am quite pleased. After two weeks this beer tasted like a 100% saison beer, which seems right given my brief question to Mike Tonsmeire on recommended temperatures for this blend. After a further week it appeared the brett had begun to consume the phenols, and the beer tasted pleasantly funky & tart, with much less saison assertiveness. I will be updating this in the future with tasting notes of the bug farm. I’ve also harvested the ECY01 blend and plan to make ten gallons of lambic with it. Cheers! and as always feel free to reach out with ideas for comparisons. We have a bunch of very fun experiments coming up as well, stay tuned! The challenge I find w/ all Brett ferments is that the mouthfeel, like you mention, is super flabby (Brett doesn’t produce glycerol like Sacc does). One thing I’ve started doing is adding 10% flaked oats in my Brett beers for the beta glucans to add a bit of fullness that’s lacking. That’s a great idea indeed, thanks. I plan on exploring 100% brett ferements quite a bit more, in all honesty a session brett like this could make the ultimate summer day beer. Will certainly try your oats tip in my next one.